Plumbing, Plant City, FL | A Step Above Plumbing Inc. Plumbing, Plant City, FL | A Step Above Plumbing Inc.
We can take care of all your residential and commercial plumbing needs in Plant City. Plumbing is a part of your life that you use every day, but you probably don’t think much about it until something goes wrong. When plumbing isn’t working correctly, we know that you want to get the problem fixed quickly and get back to your normal routine. Here at A Step Above Plumbing Inc., we provide all sorts of plumbing services to residential and commercial customers in Plant City, Florida and the surrounding area. What types of services do we offer? Toilets: We can install and repair toilets. We can also replace toilets when needed. Pipes: We can install pipes throughout your home or business. 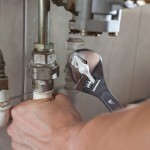 We can repair a broken or busted pipe when needed, and re-plumb your entire property. Water heaters: We provide installation, repair and replacement services for water heaters. We can also perform maintenance on water heaters to keep them running smoother and longer. Drains: If you have slow or clogged drains, don’t wait until you have an overflow and water damage to clean up. We can keep your drains running the way they should. Faucets: We can install new faucets and solve faucet problems that are more difficult. Residential or commercial, we can handle major plumbing jobs, and we can even work with contractors to complete the plumbing for a new housing development. We are dedicated to doing the job right the first time, and we will always show up on time to do the job. Contact us today to discuss your plumbing needs!